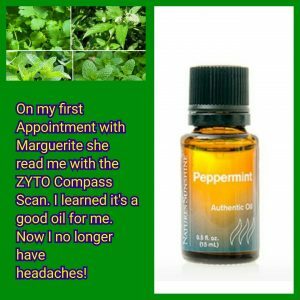 Using Peppermint oil helps headaches!!! Posted by Marguerite	| November 10, 2016	. One of my clients who comes every month for massage therapy recently told me she is so happy she learned about Peppermint oil. When she first came to my spa (located in Homewood, Illinois, a small suburb south of Chicago) she received a ZYTO Compass Scan that reads the body. With this simple device it lines up oils, supplements and other health products with her body. With her reading she learned Peppermint oil is a good oil for her. She began to use the oil regularly, diffusing the oil through her house and inhaling the oil. It helped her breathing and congestion. She told me she no longer has bad headaches since using the oil. Peppermint oil also helps digestion and relieve muscle spasms. It helps with excess mucous and respiratory infections. It even helps with morning sickness. Nature Sunshine Products carries top quality essential oils. They have a fabulous line of single oils and special blends.